Done With All 27 paintings! Pin It I never would have thought I could complete 27 paintings in three and a half days but I am actually done! My husband says I really only need 25 but I opted to paint a few extra just in case. Much better idea than running up to my studio an hour before the dinner tomorrow night if we get a last minute add! Crazy as it was, I learned a lot from this marathon challenge this week. No need to spend so much time "thinking about a painting". It is more important to just start painting! I think I will add aliz crimson to my limited palette. Such a wonderful color to add flare to a painting and I had a blast mixing with it. Of course it is all over my clothes, the phone, the light switch and my ipod! Finally, when I was eight years old my mom told me that Christmas is a lot more special if you can be just as excited about giving gifts than receiving them. I listened to her advice and ever since I have turned December into a massive gift creating process ... handmade quilts, stained glass, cookbooks, advent calendars, comb cases (when I was eight), sewn outfits ... 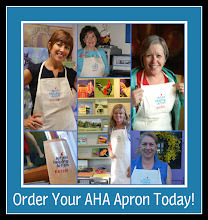 I have just about made every possible gift. And yes ... I have wrapped some that were incomplete ... ask my dad about the fabric hanging over a hanger. I am sure over the years many of them were duds ... but my family was always gracious upon receiving their homemade gift. I can't wait until tomorrow night as I can proudly say, these are the best homemade gifts yet! Twenty One down and Only Seven More to Go! Pin It It is 10:30 am on Thursday and twenty one paintings are finished! I do think that I am going to finish this crazy painting marathon. I am getting so excited to share these "gifts" with all of my friends. I even went to bed early last night because I was becoming the "mad woman with the palette knife"! After a good night's rest I have decided I am going to finish today. So ... 28 paintings in three and a half days ... I never would have believed it! It's funny too that so far all of them have turned out. No scraping needed and there is only one that I am not crazy about. It is still taking me about an hour to complete each one and I am finding that I am now starting to venture out with new colors and having more fun! I promise to take a picture of all of them when they are completed and I will post the photo tomorrow - so you all know that I really did finish! I will then continue to post two of the paintings a day ... which will give me some time to work on larger paintings for the upcoming Gale's show. Thanks again for all of your encouragement. A few of you commented about drying time so I went on line this morning and ordered thirty 6 1/2" x 6 1/2" clear plastic flat boxes that I will put all of the paintings in before I place them on the table. I am so excited to give these away on Saturday night! It will be a great way for me to share something with my dearest friends. My husband also says that we have a few friends that can't attend so it looks like I won't need 32! Yippee. Maybe only 29 couples will be there. Maybe I will paint one for those who can't come ... but they will have to get them at a later date! In case you missed yesterday's post, I have decided to paint thirty two 6" x 6" paintings as party favors for my 50th birthday dinner this Saturday night. Unfortunately I didn't decide to do this until last night so I am doing a "Marc Hanson" and have embarked on a painting marathon! So far, so good. I have not yet turned into the mad woman with the knife (palette knife that is) but I am sure I will be by Friday ... I have finished eight of the thirty two and I hope to finish four more tonight. My middle son has a CIF baseball playoff game this afternoon so that will take a few hours but hopefully I will have the energy this evening ... keep your fingers crossed! My wonderful husband is throwing me a "50th" birthday dinner this Saturday night and I have been searching for the perfect "party favor" gift for weeks. Everyone that is attending is a dear, dear friend and I really want to give them all a wonderful thank you gift. At first I thought of gift cards (which depict my paintings) ... but that seemed boring. Then I considered putting together a small gift box containing a few of my favorite things such as candy, etc. But that seemed boring too. Finally, I came up with the perfect idea ... I have decided to paint 32 paintings. In four days. I figure if Marc Hanson can paint four paintings a day in plein air then I can paint eight a day in my studio. I just bought the art panels and they are all 6" x 6". And they will all depict my favorite subject matter ... boats! Stay tuned ... I will post as I paint. Off to the studio!!! Rooster III, Oil 12" x 12"
We spent another day at the CIF Swimming Championships but this time it was all of the top finishers from four divisions combined in to a Masters meet. Fortunately my son had more victories and record breaking swims. Sadly, we are now finished with high school swimming. Although I will miss it terribly, I am really excited to follow his college swimming career! Lots to look forward to! You will need to click on to this picture to see the wild palette knife strokes in this one. I find that I rarely use these reds and I know I should do it more often. The aliz crimson (red) is such a powerful and fun color to use. I should consider adding it to my limited palette! Rooster Face, Oil 8" x 6"
I have been painting roosters the past few days for my show at Gale's Restaurant and I couldn't resist this view ... I don't know if I will include this one in the show ... it's pretty funny looking! Thanks to all of you for asking about my son's swim meet this weekend. He was amazing and made us very proud parents. He broke two records, including a 28 year old record in the 200 freestyle! Yippee! A Rose is A Rose, Oil, 8" x 6"
I have been to two fiftieth birthday celebrations in the last 48 hours. Many of us are turning the big "50" this year and now that the big day is getting closer I am actually excited! To my friends Sue and Annie ... Happy fiftieth and thanks for letting me share in your special celebrations. This weekend my oldest son is competing in his last year of CIF Southern California swimming championships and what a wonderful time it has been. Finals are later today so please keep your fingers crossed for a few records! Given the absolute lack of time this weekend, this painting was completed in the fastest time I have ever painted a painting. It is not as if I sat down to paint this in a hurry ... it just went really fast! "A Rose is a Rose" took me ... actually I will let you guess! Of course, remember that it really took me "years of studying art and countless classes and workshops" to paint this (I love it when artists say that). In your guess ... please include paint mixing time as I always do that first. It will be interesting to hear your guesses! Near the Rialto, Oil 6" x 8"
I did this quick little study in preparation for a larger painting. I am painting much larger pieces this month as I get ready for the show at Gale's restaurant in July. Having fun but it is exhausting! Clint Watson featured Marian Fortunati and "yours truly" in his newsletter today. Click here to read! Every few days I visit my website to monitor the traffic and see how many "hits" I have received. Usually I average about fifty or so a week. You can imagine my surprise when I checked it last night and I had received almost 100 hits in a day. I spent a considerable amount of time trying to figure out what had happened. My first explanation was that since I had donated a painting to a fundraiser over the weekend and left some of my business cards to display ... perhaps that was it? But it hardly made sense that 25 business cards could lead to so many hits. 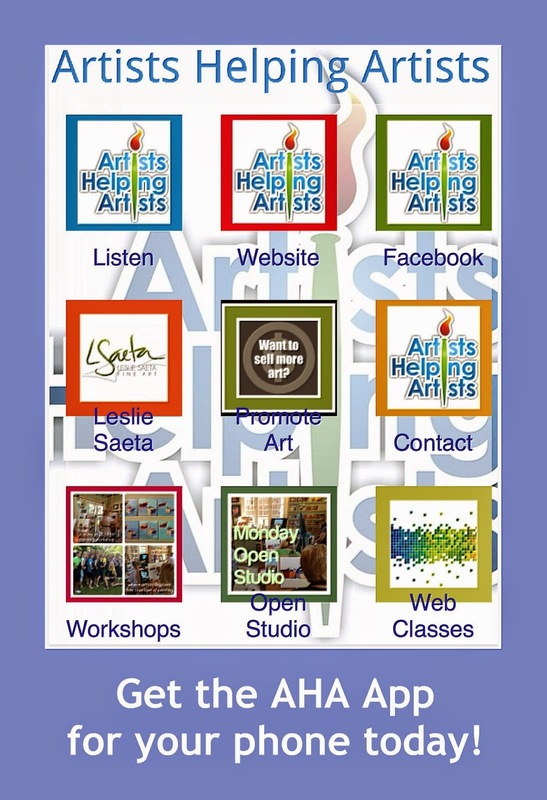 The idea for my new newsletter was based on a daily email I receive from Clint Watson at Fine Art Studio Online. I have mentioned him before and if you are an artist and you don't receive his newsletter, sign up now! 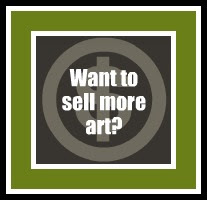 He offers amazing ideas and suggestions on how to build your business and sell your art. 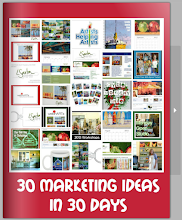 First and foremost he suggests that artists create a mailing list and send out a monthly newsletter. So I did that on May 1st. After I experienced immediate sales from my first newsletter I sent a thank you email to Clint. He kindly responded asking for permission to reprint my email. Then he posted my thank you on his blog and included a link to check out my art! Hence the 100 hits in one day. So ... of course I sent him another thank you email. He responded saying they were going to feature my email tomorrow in their newsletter. And he thought I could expect even more visitors to my website! Clint has said over and over in his newsletter that you should always take the time to say thank you. He suggests you show appreciation to your customers/collectors and hand write thank you notes as often as you can. So I spent 45 minutes this afternoon looking for Clint's mailing address so I could send him a hand written thank you note as well. It is so easy to get caught up with email ... so I suggest you all take the time to send a handwritten thank you note today! I had to mention one more thing. Clint is a great writer and really funny. My favorite line on his site is: "If you liked today's newsletter, please forward it to a friend, if you didn't like it, feel free to forward it to your enemies ;-)". Finally, thank you to Marian for mentioning today that she saw my name on Clint's blog! Waiting to Sail, Oil 11" x 14"
I had a request for this painting and so I used the same composition as the original but different boats and colors. I like the final outcome! Mother's Day was wonderful as I was able to spend to brunch with my family - so nice to be with my mom. Then my husband and boys cooked me a fantastic dinner. I also managed to sneak in about three hours of gardening ... so it was wonderful! Street Scene II, Oil 10" x 8"
I painted a very small version of this scene awhile back and decided it was worthy of a slightly larger one. I brightened up the colors a bit (gee ... shocking I know ...) and I really like the way it turned out. I am hosting Happy Hour in a few hours ... I think today is a good day to start the weekend early ... the Lakers play tonight and it has been a long week ... so time to start the weekend! Happy Mother's Day! Rooster II, Oil 12" x 12"
Balboa Island, Oil 14" x 11"
My paintings seem to be coming off the easel a lot "brighter" these days. This one is not quite yet done but close ... I wanted to paint something bright and fun. We went to the Laker playoff game last night and it was so painful to watch my team play so poorly. This will hopefully cheer me up! And go Lakers! Waiting For Christmas, Oil 14" x 11"
I want to thank all of you for such an amazing response to my newsletter. There have been so many wonderful comments from many of you and I appreciate the wonderful feedback. The good news is ... it worked ... as I have already sold three paintings since the newsletter went out three days ago. And they are all new collectors of my art! I also know that 61% of the people I sent the newsletter to actually opened it and another 58% have gone back to look at it more than once. And please don't think I calculated these statistics ... they are readily available with the newsletter program I am using (Constant Contact)! It is still not too late to sign up for the newsletter if you are interested. I spent some time painting this weekend once I tore myself away from my computer and finished this one yesterday. They are fun colors and I didn't even think about the red and green until after it was done! Pin It Quite some time ago I mentioned how excited I am that I have scheduled a solo show at one of my favorite restaurants in Pasadena, Gale's Restaurant. Gale's is wonderful ... authentic Italian cuisine and the owner, Gale Kohl is simply amazing. My show will be held from July 13 - September 15, and the Opening Reception will be July 19th from 4:00 - 6:00 p.m. Please mark your calendars! 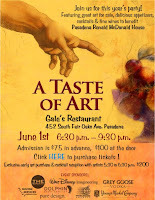 Not only does Gale feature artists in her restaurant but every year she holds an amazing event called A Taste of Art. This year's event will be on June 1st and all proceeds will benefit the Ronald McDonald House. I would personally like to ask any artists out there to consider donating a painting for the auction. This is for a wonderful cause and please email Gale at gale@galesrestaurant.com if you are interested. She is collecting donations this week so if you can spare a painting, please act quickly! To find out more about the event, or to purchase tickets, click here. A Quaint Street, Oil 10" x 8"
I mentioned a bit about my newsletter in an earlier post this week. As much as I LOVE my blog (and all of you!) I realize that most of the readers of my blog are artists. I decided I need to also reach out to everyone else. So, I signed up with the company Constant Contact which enabled me to set up an email database and also create a newsletter. They also keep you "spam compliant" which apparently is important these days. 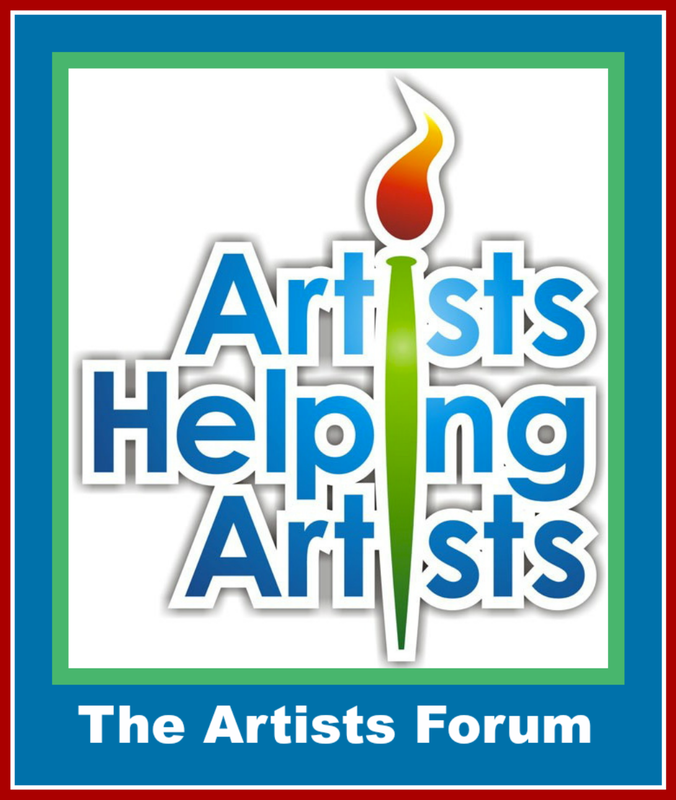 I receive two daily newsletters that discuss marketing for artists (they are written by Clint Watson and Tony Moffitt). 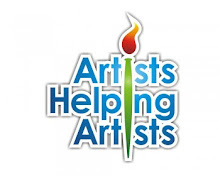 Both of them encourage artists to develop a mailing list and monthly newsletter. I guess it finally sunk in. So, this morning I sent out the May Newsletter. My initial list has just over 300 contacts and I hope it will continue to grow throughout the year. I am featuring two fun monthly columns which are "Where to Find Really Good Art" and "My Favorite New Artist". 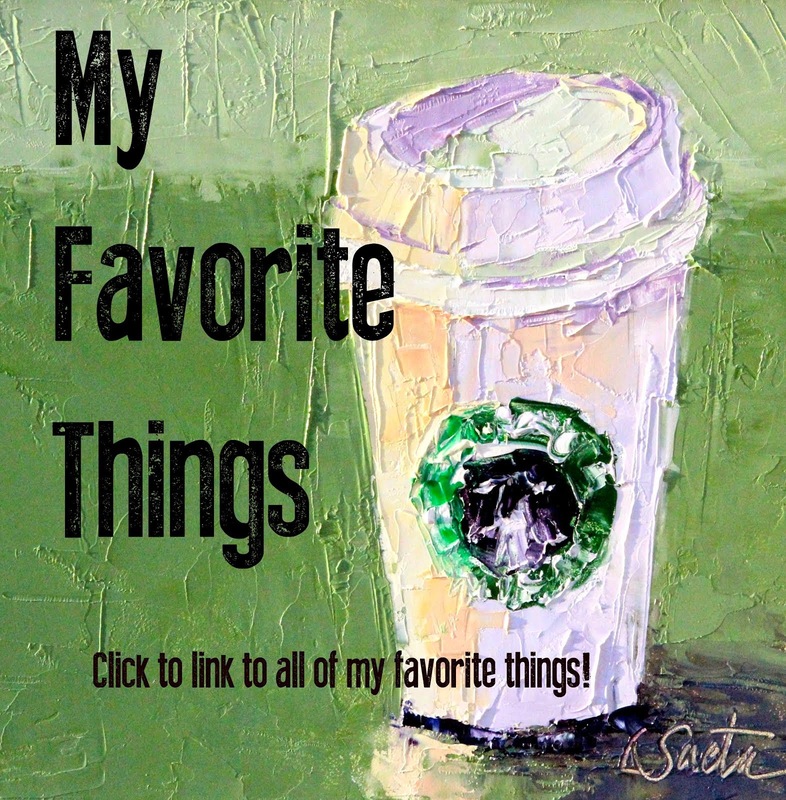 I am excited to feature some of my favorite artists in my newsletters to come!